Today’s been a tough old day. I’m trying to think of the humourous side, but I’m struggling! I think the crushing lack of sleep (all 3 girls were up in the night last night, and baby R cried for an hour straight from 4am, with no let-up (teeth)) cut into my steely-eyed resolve and reserves. Today, the appointment with the paediatrician came. Baby R was relatively happy for the nurses to weigh and measure her so long as she maintained eye contact with me. She was blatantly thinking: “It’s December, it’s -10degC in the middle of the afternoon and I’m naked in a cubicle. Two strange women in white are cooing over me and my nappy contents. This is not dignified. I’m not impressed, Mother. Don’t pull this stunt again. Last warning”. She was even ok with the doctor. “You warmed up the stethoscope first – I’ll let you off with a warning grizzle. Next time it’s The Shriek. I mean it”. The doctor suggested she have a blood test to confirm whether it was an allergy to yolk, albumen, both, milk, house mites, dust, cat or all of the above. “And we’ll do a full blood count if there’s enough blood”. My insides wobbled at the prospect of anything sharp hurting my baby, but hey, it couldn’t be worse than her 500 vaccinations, could it? (I exaggerate – it was only the standard 6 or so over 3 months). Um. It could. We went to the children’s ward for the doctor and staff nurse up there to do it. I did a sterling acting job in nonchalently walking into the same room that only 9 months ago Middle Minx had been jabbed 11 times in an effort to site a cannula (she’d been admitted to hospital overnight with dehydration, along with all the other children filling the ward that night – bad v&d bug). An aside: a wonderful nurse came every hour to feed Middle Minx a few teaspoons of fluid instead, right through the night. It was 2 weeks before Mini Minx was born just one more ward down the corridor. Unlike the other wards, the children’s ward staff were, and are, just fantastically and endlessly patient, caring and kind. After much patting and stretching and frowning from the doctor, the first stab site was selected: baby R’s wrist. The nurse held her hand forward, the doctor eased the needle in, with no local anaesthetic, and R blinked seriously at him twice. She looked from needle to his eyes and back again. Then up at me. Then back to the needle. The little tube of blood stopped growing into a bigger tube and the nurse squeezed R’s wrist. 2 fat little drops of blood were coaxed out. The doctor sighed and went to fetch the consultant. Santa came in (honestly!) and shook my hand. I nearly curtseyed. Then he spent 20 minutes prodding, stabbing, saying “No, no, never do xyz” to the suddenly nervous doctor, who was trying to help. This time, baby R was having none of it, and wailed her little head off. The consultant propped R on a bed so it was easier to hold her still. Like her big sister, it took 4 adults to stop her thrashing too much. She sobbed and screamed, not understanding why I wouldn’t take the pain away. I didn’t count, but it was 3 attempts to the right wrist, 2 to the left, and finally enough blood was taken from her heel for it all to stop. Santa managed a grimace of a smile and peeled his shirt away from his armpits. Poor man – my Mummy Guilt was in overdrive, so his Nice Old Man Guilt must have been redlining. As I gave R a consolatory breastfeed in the day room I apologised to her for causing her the pain and indignity and trauma. Poor little mite! If I’d had any inkling it would have been like that I’d have refused the blood test, settling for label reading and avoiding all egg instead. I only allowed the blood letting (!) to continue after the first tears because I thought I needed to make it worthwhile – why hurt her to just abandon it and not find out which allergens to avoid? And I suppose it’s an advantage to be pre-warned that her veins are as small and weedy as mine and Middle Minx’s if she ever needs blood taken / cannulas sited / drips installed. After an exhausted nap from all the screaming, R woke up as sweet-tempered and happy as ever. She’s forgotten it all, and the bruising to her hands doesn’t seem to be causing her any pain. 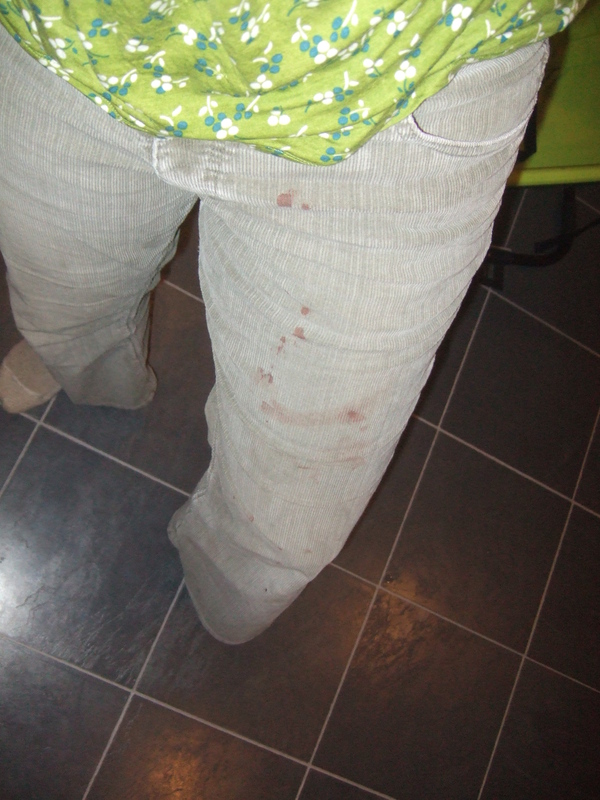 Ironically, her heel didn’t stop bleeding for a bit, so my trousers have more blood on them than was sent to the lab. The one plus of being at the hospital today? The Boss took the afternoon off work to watch the kids, so did the big Christmas Food Shop in the madhouse that was town today with Midi and Maxi Minx, instead of me. That would have traumatised me forever, but they all seemed to enjoy it (mentalists!). So it’ll be turkey for Christmas Dinner. It’s currently -11degC; tomorrow’s forecast high is -6degC. It can snow all it likes, now: we’ll dine like kings for the next week. I iced the Christmas cake to de-stress from upsetting my baby. The kids parcelled up their home-made peppermint and chocolate-drizzled creams that we made in a fit of Christmas nostalgia. And most important of all? I finally purchased the coloured chalks that Maxi Minx asked Santa Claus for her Christmas present!! So bring on Christmas: we’re ready at last! This entry was posted in baby milestone, Christmas, Mummy Guilt and tagged blood test, children, Christmas food shop, egg allergy, hospital by GrumpyOldTrout. Bookmark the permalink.